What? From the show website: "World Premiere Searing Drama-After surviving a tragedy, estranged husband and wife Don and Janna go on a series of “blind dates,” to try to save their marriage. 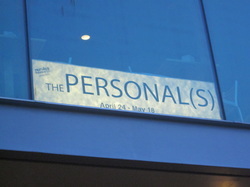 Based on the critically acclaimed films by Stanley Tucci and Theo Van Gogh The Personal(s) is the third incarnation of a story that is often compared to the classic Whose Afraid of Virginia Woolf. Both heartbreaking and hilarious, The Personal(s) is a moving inquiry into humor, compassion and our ability to endure." Why? This will be the first show I've seen by this theater company, and was happy to find the show available on Goldstar. Well? I loved the set for this play; it was rich in detail and, for a small space, allowed for interesting shifts in the action, that were necessary for the segmented story. I can't say I loved the story itself. I very much liked the premise of two people trying desperately to find their ways back to each other after a tragedy in the relationship. And I also enjoyed the device of contact between them being made through ads placed in code in the personals section of the newspaper. However, I didn't find the two main characters to be likeable enough to root for individually, or as a couple (except as they seemed to be sadly suited to each other). The extreme anger, despair and cruelty became suffocating; the audience mood seemed to sink lower and lower as the story progressed. I also thought the character of the bartender could have been better used in the story to offer insight or represent the audience's perspective perhaps. That said, the three actors were all quite good; handling the difficult material with full commitment and passion. What? From the show website: For its 21st annual Spring Gala, the Kennedy Center presents My Fair Lady in Concert on the Concert Hall stage. The famed 1956 musical features book and lyrics by Alan Jay Lerner with music by Frederick Loewe and will be directed and choreographed by Tony Award nominee Marcia Milgrom Dodge. The concert staging will be accompanied by the 35-piece Kennedy Center Opera House Orchestra conducted by Music Director James Moore. Casting for this one-time-only event includes Tony Award winner Gregory Jbara as Alfred P. Doolittle, Olivier Award winner Laura Michelle Kelly as Eliza Doolittle, Academy Award and multiple Emmy Award winner Cloris Leachman as Mrs. Higgins, Tony Award nominee Mary Beth Peil as Mrs. Pearce, two-time Tony Award winner Jonathan Pryce as Henry Higgins, Max von Essen as Freddy Eynsford-Hill, and Michael York as Colonel Pickering. 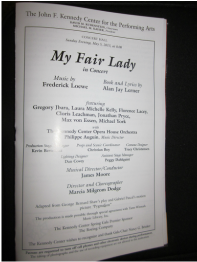 This performance is made possible through special arrangement with Tams-Witmark Music Library, Inc.
My Fair Lady is adapted from George Bernard Shaw's play Pygmalion and Gabriel Pascal's motion picture. The story is about a poor Cockney flower girl (Eliza Doolittle) who takes speech lessons from a snobbish phonetics professor (Henry Higgins) in order to pass for a lady in high society. It features one of Broadway's most beloved scores including "The Rain in Spain," "I Could Have Danced All Night," and "Get Me to the Church on Time." Why? No brainer :). Great show. Great cast. 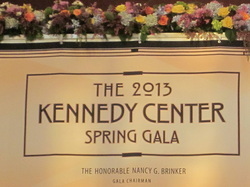 Access to priority ticketing for events like this is why I am a member of the Kennedy Center. Although I don't subscribe, being a member offers benefits that I appreciate, such as this, and still leaves me with flexibility as to what, when and with whom I choose to see shows. Well? Loverly :). 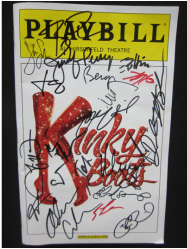 The highlights were definitely Laura Michelle Kelly, Jonathan Pryce and Max Von Essen. Their superb voices and wonderfully charismatic acting lit up the stage. The ensemble, made up of local talent, was also excellent, and I really enjoyed the clever choreography (always a challenge in a concert presentation of a musical). I was sitting in one of the tiers, high up, but close to the stage. It was an acceptable seat, but Concert Hall event attendees are cautioned that parts of the stage are obstructed from these side tier seats. What? From the show website: "This OUTRAGEOUSLY fun show tells the uplifting story of a trio of friends, on a road trip of a lifetime, who hop aboard a battered old bus searching for love and friendship in the middle of the Australian outback and end up finding more than they could ever have dreamed. An international hit with over 500 dazzling, 2011 Tony® Award-winning costumes, Priscilla Queen of the Desert features a hit parade of dance-floor favorites including "It's Raining Men," "Finally" and "I Will Survive." 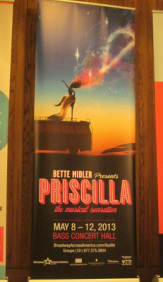 The Hollywood Reporter calls PRISCILLA "funny and fabulous! Joyous entertainment with eye-popping visuals and unexpected heart!" Why? If you have visited this website over the past year, you are well familiar with my affection for this show :). I knew the tour would be making a stop in Austin, and I thought my Austin friends would really enjoy the show, so we arranged my regular visit to allow me to share it with them! Well? The show is traveling well! I didn't really notice too much skimping on the staging, and it's just really hard not to have a good time with this score! My favorite of the lead trio was definitely Scott Willis as Bernadette. 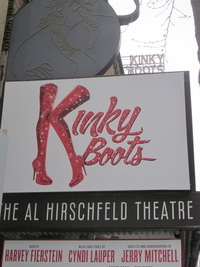 I have to admit to sorely missing Will Swenson, Nick Adams and Tony Sheldon, and the cavernous feeling of this venue is a bit of a challenge when it comes to feeling the emotion of the show. But there's so much heart in the story, that I was still drawn in (even if it was farther away :)). My friends enjoyed it a great deal, and that was the main reason for going, so it was definitely a success! What? 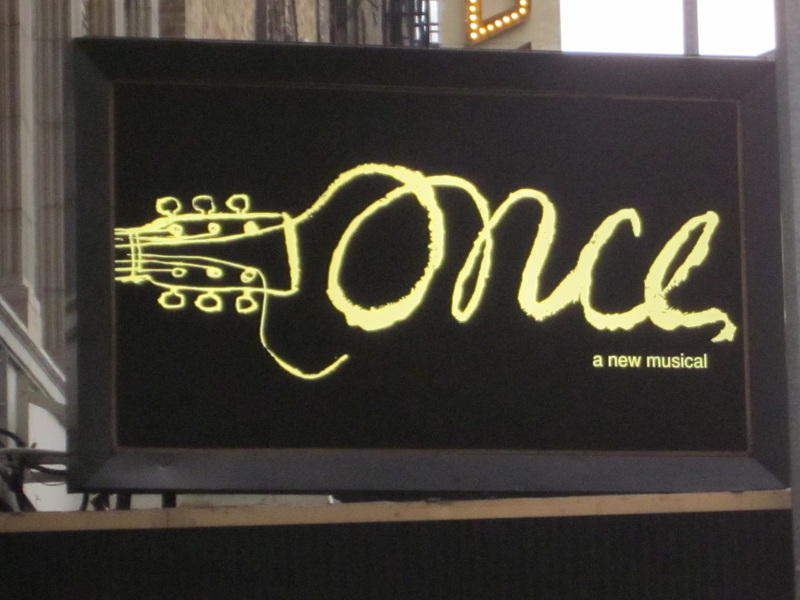 From the show website: "once is the celebrated new musical based on the Academy Award®-winning film. It tells the story of an Irish musician and a Czech immigrant drawn together by their shared love of music. Over the course of one fateful week, their unexpected friendship and collaborationevolves into a powerful but complicated romance, heightened by the raw emotion of the songs they create together. Brought to the stage by an award-winning team of visionary artists and featuring an ensemble cast of gifted actor/musicians, once is a musical celebration of life and love: thrilling in its originality, daring in its honesty... and unforgettable in every way." Why? At the request of the niece (who loves the music); and I'm intrigued to see the new cast members! Well? The look of delight on my niece's face, her raptness and laughter gave me immeasurable pleasure. This was what I'm calling her first "adult" musical. By that I mean, no big, splashy production numbers~just a gentle, lovely romantic story. She's an experienced theater-goer, but has had a fairly steady diet of big musicals. 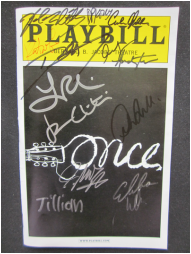 I played her "Falling Slowly" in advance, and she fell in love with the song, and then with the show. The stage door was a must for her, and she insisted on a photo with Arthur Darvill, "Guy," her favorite character/performer. Her other favorite was the always entertaining Lucas Papaelias; his comic performance is also one of my highlights. This was my first time seeing the new pair of leads, and I thought Darvill showed a more expressive, open "Guy," and I truly enjoyed the chemistry between him and Joanna Christie. That partnership is crucial. That said, I did miss Cristin Milioti, whose embodiment of "Girl," with her unique and beautiful voice consistently broke my heart in all the right ways. What? From the show website: "Everything has its season... and this season, PIPPIN returns to Broadway for the first time since it first thrilled audiences 40 years ago! 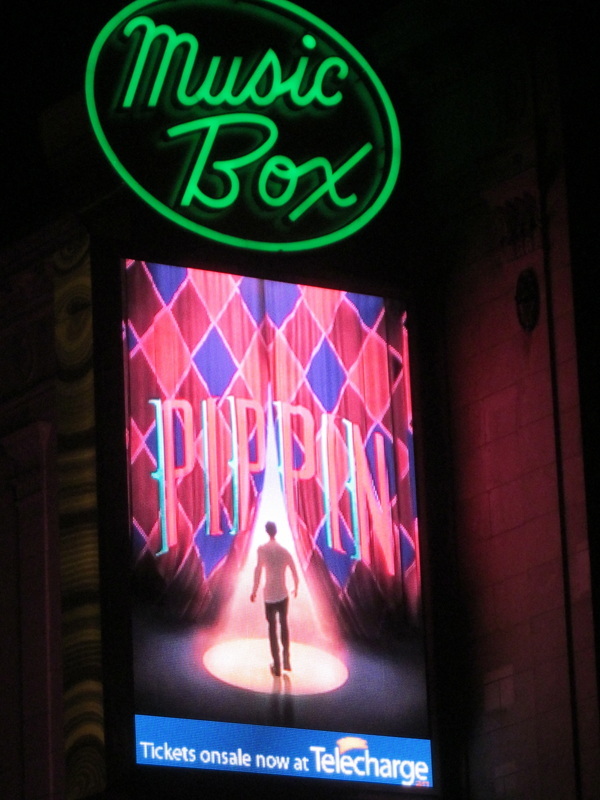 With a beloved score by Tony Award® nominee STEPHEN SCHWARTZ (GODSPELL, WICKED) that includes the favorites "Magic to Do," "Glory" and "Corner of the Sky," PIPPIN tells the story of a young prince on a death-defying journey to find meaning in his existence. Will he choose a happy but simple life? Or will he risk everything for a singular flash of glory? Direct from an acclaimed run at Boston's American Repertory Theater, PIPPIN is directed by DIANE PAULUS, director of the 2009 and 2012 Tony Award winners for Best Musical Revival (HAIR and THE GERSHWINS' PORGY AND BESS). This captivating production features sizzling choreography in the style of BOB FOSSE and breathtaking acrobatics by LES 7 DOIGTS DE LA MAIN, the creative force behind the nationwide sensation TRACES. 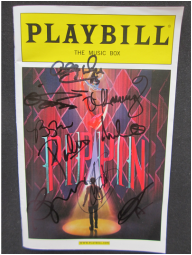 Join us... for a magical, unforgettable new PIPPIN." Why? Can't wait to see this again and again :)! Well? What can I say? It just keeps getting better for me. I notice more nuances and focus on different performers, and the experience of the show gets richer each time. I adore the music, and am impatiently awaiting the cast recording. My niece adored everything about the show; especially the music and the look/feel of the show. Her favorite performer in this show was Patina Miller as Leading Player, and I really can't argue. She's amazing :). But as I always say, it's the chemistry of the entire cast that turns a good show into a magical experience, and this cast has got chemistry in spades. Why? From the minute my niece heard about this show, it became a priority that I take her to see it. During the opening number, I knew her instincts were right! I loved it and so will she. Well? So the niece loved it every bit as much as she (and I) knew she would! The feel-good message, story and music all work together to take us on such an enjoyable journey through our humanity. Billy Porter as Lola topped my niece's list of favorite performers. We talked and talked about the show afterward~always the highest compliment that we can pay to a show (same with Pippin and Once!). What? From the show website: "STC is proud to announce a newly commissioned adaptation and translation of Friedrich Schiller’s Wallenstein by former poet laureate Robert Pinsky. Wallenstein, one of Germany’s greatest dramatic works, follows the famous general Albrecht von Wallenstein at the height of his influence and power during the Thirty Years’ War. 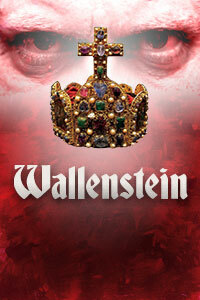 Leading Europe’s most powerful army, Wallenstein is caught between his ambition and his Emperor’s growing distrust. He must decide either to stay loyal to his king and lose his power or to betray his country for greater gain. STC Artistic Director Michael Kahn, called “one of the best directors in America” (DC Theatre Scene), envisions this epic story of war, intrigue and loyalty tested." Why? I'd been intrigued by this Hero-Traitor pair of plays (w/ Coriolanus; see below), being presented in repertory; and then STC offered a great 3-play/$99 discount offer that made my decision. Well? I found this to be a fascinating character study, and highly entertaining somewhat fictional "window on history." The performances by all the actors were superb; taut, sharp and fluid. The cast worked well together as a unit; important to the military subject matter. In honesty, on reading the play description, I might have thought the story was not in my wheelhouse, but this is precisely why I make such an effort to see a range of works. The staging of the play was clever and highly atmospheric, and Steve Pickering as General Wallenstein was riveting. It so saddened me that circumstances caused me to miss my scheduled date for the companion play, "Coriolanus." I hope to see it someday to complete the experience. What? 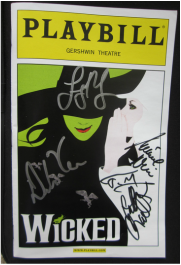 From the Playbill.com website: "Wicked is the untold story of the Witches of Oz. Long before Dorothy drops in, two other girls meet in the land of Oz. One, born with emerald-green skin, is smart, fiery and misunderstood. The other is beautiful, ambitious and very popular. Wicked tells the story of their remarkable odyssey, how these two unlikely friends grow to become the Wicked Witch of the West and Glinda the Good. Wicked takes a revisionist look at an American icon of evil and discovers how the young Elphaba, a passionate, committed young woman from Oz, becomes the Wicked Witch of the West. Her character is contrasted with that of her school roommate Glinda, who grows up to be the Good Witch." Why? A cast change I can get behind prompted this return visit: Lindsay Mendez from "Godspell" and "Dogfight," taking over the role of Elphaba. Also excited to see her "Dogfight" costar, Derek Klena, assuming the portrayal of Fiyero! Well? Lindsay definitely brings a new energy and a soaringly beautiful voice to the show. She is charming and a bit less aloof than some of the other Elphabas I've seen (they've all been wonderful too!). I particularly liked the personal style Lindsay brought to these songs I know so well; it was fantastic to hear something just different enough to cause me to hear the familiar lyrics with a fresh ear. I also loved her chemistry with Derek Klena as Fiyero; he's a charming addition. What? 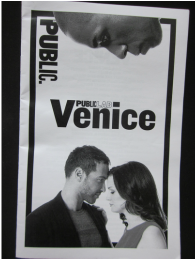 From the show website: "An electrifying new musical, VENICE will ignite the stage with a fusion of musical styles from hip-hop and rock to soaring anthems of love and hope, tracing a young man's rise as he fights for what's right against a backdrop of deceit and sibling betrayal. Part epic romance, part political tale, VENICE will transport you to a fallen city in the not-so-distant future where revolution is in the air, political structures are crumbling, and only the children of the city's fallen heroes can change the course of history. If you dream of peace, follow us. If you dream of freedom, follow us. If you know these are not the same thing, well…are you ready?" Why? One of the best decisions I made in the past year was becoming a member of The Public Theater in NYC. The diversity of the works being presented is fantastic, and the prices (in keeping with the tradition of this theater) are reasonable enough to allow me to see many of the shows. And I really do love seeing new musicals! Well? Exciting and compelling work. The hip hop beat and style is such a good fit for the intensity of the story, and Matt Sax (composer and narrator) is a master. His voyeuristic presence throughout the show emphasized the storytelling nature of theater, and the amphitheater-style seating/set made great use of the small space, while giving the big story of power, betrayal and love space to project. The standouts for me, aside from Matt Sax, were Leslie Odom, Jr., Uzo Adubo and Jennifer Damiano. Each is a good fit for their roles and Uzo's voice continues to blow me away. What? 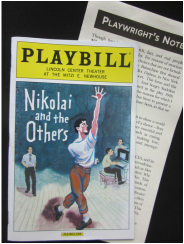 From the show website: "It's 1948 and during a spring weekend in Westport, Connecticut a close-knit group of Russian emigres, including choreographer George Balanchine, composer Igor Stravinsky, conductor Serge Koussevitsky, painter/set designer Sergey Sudeikin and composer Nikolai Nabokov, gather to eat, drink and talk. 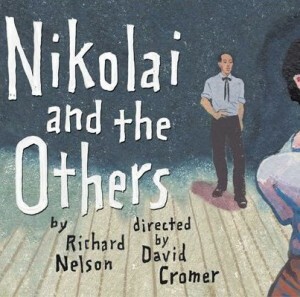 This will be the world premiere of Nikolai and the Others, commissioned by Lincoln Center Theater. It will be directed by David Cromer (When the Rain Stops Falling at LCT, and acclaimed productions of Our Town and Tribes at Barrow Street) who takes this momentous weekend in the country and brings it to life with a wonderful cast. Interspersed throughout the action of the play will be moments of Balanchine's original Orpheus choreography." Why? The story and subject matter is right up my alley. Love dance, love Balanchine's work, love Lincoln Center Theater! Well? An intense, fascinating play, with a lovely set. The cast was tremendous, especially Michael Cerveris as Balanchine, Blair Brown as Vera Stravinsky, Kathryn Erbe as Natasha Nabokov and Stephen Kunken as Nikolai Nabokov. The decision to have the actors speak without accent while the discussion was taking place in Russian, and with accents when the characters spoke in English was clever, and the transitions from one to the other heightened the sense of exclusion of those (including the audience presumably) who were not part of the tight knit Russian arts community in America during the postwar era. I did not know the circumstances reflected in the story (fictionalized in some aspects, but not others), and it was so interesting to learn a bit from this intimate perspective.